In today's post, we're going to spot errors on the tube map. That's the printed tube map, the one you pick up for free in stations. There are several errors on it which have somehow gone unnoticed. This is the very top of the index on the back of the printed map. The error is right there in the first handful of stations. Have you spotted it yet? It's not the grid references, it's not the spellings, it's not the symbols and it's not the zones - they're all fine. It's the order the stations are listed in. Stations should appear in alphabetical order, but they don't. Look at the Actons. The order should be Acton Central, Acton Main Line, Acton Town... 'C' before 'M' before 'T'. But instead Acton Main Line has been listed after Acton Town, when it should come before. How did that happen? This error's been on the printed tube map since May 2018, when TfL Rail (to Heathrow) appeared for the first time. The other new stations - West Ealing, Hanwell, Southall and Hayes & Harlington - were all added to the index correctly. But Acton Main Line was slotted in wrong, and nobody noticed, and hundreds of thousands of copies were printed. Here's the next alphabetical slip... and we're still only in the A's. This time it's a tram stop that's wrong. Arena (A-r-e) should come after Archway (A-r-c), but instead it's been slotted in before. Amazingly, this error's been on the tube map since June 2016. That was the trams' very first appearance on the map, including the addition of 37 tram stops to the index... and it seems someone managed to add Arena in the wrong place. That was also the notorious map which put Morden in the wrong fare zone and had to be reprinted, but this alphabetical error slipped through unnoticed on the other side. The next problem is with the 'Beck's. Beckenham Junction should come before Beckenham Road, as anyone who understands alphabetical order should know. That's so basic it really should have been obvious... but that's not the end of it. Beckton and Beckton Park should be adjacent, but instead they've been rent asunder by the two new tram stops which should instead have come first. That's two errors here, and four so far in total, and we're not even out of the B's. Let's hit the C's. You know what you're looking for now. This time the misplaced pair are Church Street and Chorleywood. C-h-u comes after C-h-o, as every grammarian knows, but inexplicably someone's placed it in front. That's an 'A' error, two 'B' errors and a 'C' error all involving tram stops, suggesting that whoever added the tram stops to the index wasn't thinking carefully about where they went. A big jump now to the letter T. But yes, it's the tram stop that's wrong again. Therapia Lane starts T-h-e-r, which ought to place it inbetween T-h-e-o and T-h-e-y, but instead someone's placed it first. This particular trio's a bit more challenging to put in alphabetical order, but nothing worse than the exercises some of us were doing in primary school, and an index like this deserves to be 100% correct. Amazingly all these misplaced tram stops - Arena, Beckenham Junction, Beckenham Road, Church Street and Therapia Lane - have been wrongly listed since June 2016. Nobody spotted the error then, nor on the December 2016 map, nor on the May 2017 map, nor on the January 2018 map, nor on the May 2018 map. Five chances to get it right, five chances missed... and before we smirk, we all missed it too. This next error's a bit different. And it involves the 'Wood's. Initially the tram stop, Woodside, might look OK, fitted in between Wood Lane and Wood Street. But hang on, the station after Wood Street is Woodford, and 'f' comes before 'S', so what's going on here? To explain, let me show you the 'High's, which are correct. TfL have an extra house rule regarding alphabetical order, which is that single words beat compounds. Here that means High Barnet and High Street Kensington automatically beat Highams Park, Highbury & Islington and Highgate, each of which merely start with the letters H-i-g-h. You can observe this rule applied repeatedly where compass directions are involved... all the 'East's come before Eastcote, all the 'North's come before Northfields, all the 'South's come before Southall and all the 'West's come before Westbourne Park. TfL have been applying this house rule to the tube map index since May 2015, and consistently so, as is their right. But Woodside breaks the house rule, having been slotted in too early. It shouldn't appear between Wood Lane and Wood Street but between Woodgrange Park and Woodside Park. Yet again the person adding the tram stops to the index has messed up, and their error has remained on the tube map for the last 2½ years. Interestingly, the tube map on the TfL website isn't wrong. If you download the pdf and look at the index, every station is listed in correct alphabetical order, including all seven of these errors. I've also checked the tube map that was on the TfL website in June 2016, and that was correct too. There's been a correct version of the index to check against for the last 2½ years, but nobody has, and so the last five printed tube maps have featured numerous alphabetical errors. 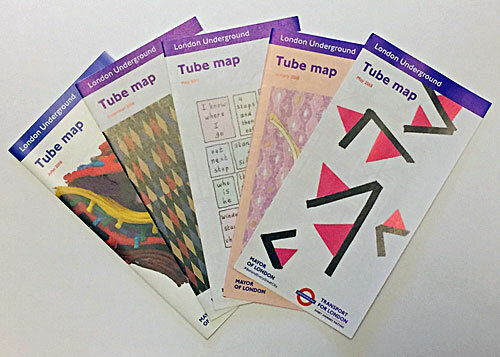 A new tube map is due to be published this month, and may already have gone to the printers. It won't now have Crossrail on it, so thankfully there aren't any extra stations for someone to accidentally put in the wrong order. But given how long the existing mistakes have gone unnoticed, by all of us, I shall be particularly interested in the index on the back of the map when it eventually appears. Saturday update: The new tube map is now out. All six tram errors, introduced in June 2016, have been corrected. The TfL Rail error from May 2018 remains - Acton Town is still listed before Acton Main Line.